Harvest BEFORE the first rain of the summer, or long after the rainy season in the dry conditions of late summer or fall. 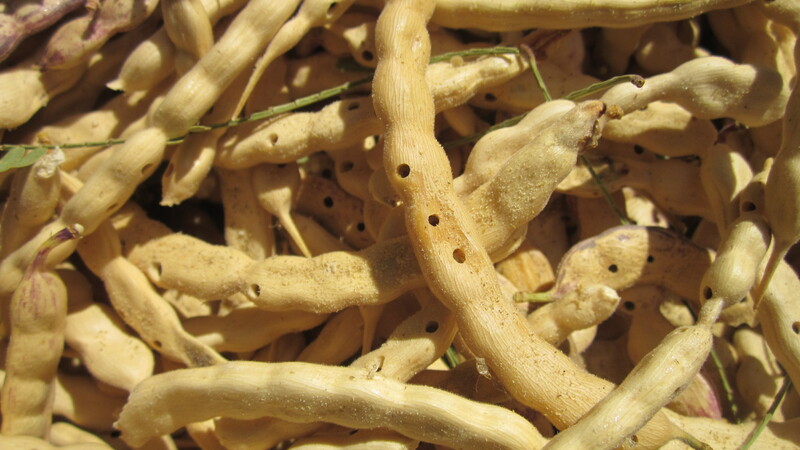 Rain on mature or nearly mature pods can cause a common soil fungus to grow on mesquite pods and many other crops. However, pods that were collected last year before the monsoons tested safe to eat. Avoiding visible mold DOES NOT insure safe pods. Dry the pods well before storage, and do NOT wash the pods. This basket has both pink stripped and plain brown mesquite pods. I am not sensitive enough to taste any difference. Holes made by bruchid beetles. If you dry your pods and store them in a nice dry place, perhaps your shed, you’ll come back in a couple of months and find them full of little holes. We used to think that they had been infested. Nope. The eggs for the bruchid beetles were laid on the mesquite flowers and the beetles are eating their way out. Soo… here are the options. Freeze the pods and kill the beetles — at whatever stage they are. Or let them eat their way out, leaving behind the odd antenna or leg. Hey, it’s all protein. You’ll want to harvest from the native mesquite trees. I planted South American mesquites on my tree lawn years ago and one of them produces the most gorgeous fat pods that look truly delicious. But, alas, they taste chalky so I just have to rake them up and toss them in the garbage. Kills me — wish I had planted natives. If you’d like to read more about mesquite, check out Jacqueline Soule’s blog on mesquite here. Get ready for prickly pear and mesquite season with some fabulous recipes for the bounty you have gathered. Check out my cookbooks Cooking the Wild Southwest and The Prickly Pear Cookbook for delicious and inspiring ways to use these delicious wild treats. the pechitas with some red striping taste sweeter than the brown or yellowed ivory color! my adopted b.l.m. wild burro who I hike with also prefers the red striped pechitas. 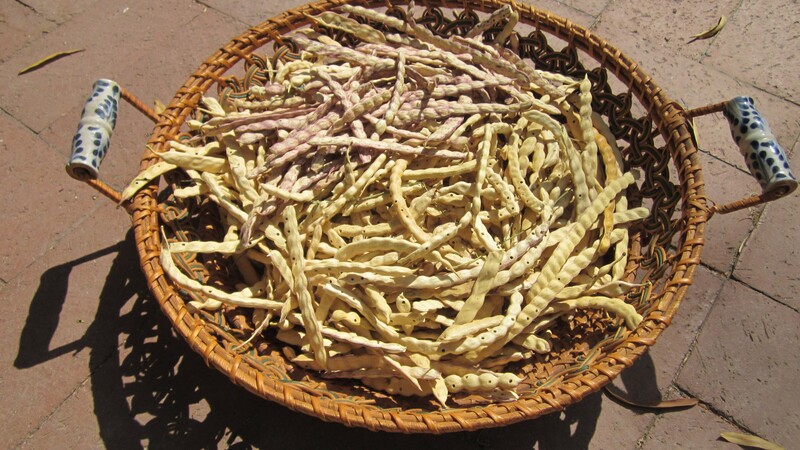 mesquite beans is one of the primary foods for Arizona range horses and burros…….. Very funny about your burro’s preferences. Can burros see colors like we do? I have two native mesquites in my yard — one red, one blond. They taste the same. However, I have read in an old ethnobotany that Tohono O’odnam women had special trees they went to every year — that they that perceived some trees produced superior tasting beans and would walk a ways to get to the preferred pods. I can’t recall color being mentioned — it would be nice to zip back 150 years and ask them! Nice job with the inaugural edition of edible baja! Thanks — didn’t the editors produce a beautiful volume. Just finished an article on prickly pear for the next edtion.